Hello and welcome to my website. Gianina Kennel is based in Jakarta, Indonesia and Melbourne, Australia. It is a small kennel and it is kept small so I can spend more individual time with my dogs with the training and attention that they deserve. I only have 1 litter a year or sometimes none. I bred only when I need another dog for show. I have been showing & breeding Miniature Pinschers since 2002 and then add Staffordshire Bull Terrier breed in the year 2008. 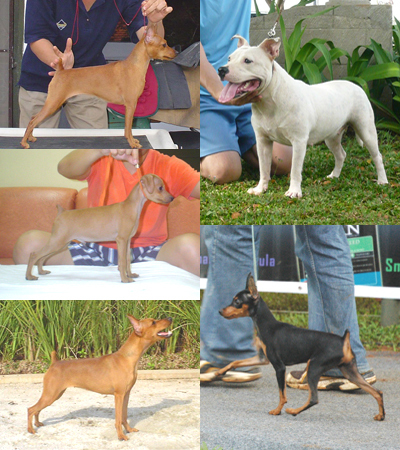 Up to now, in the Miniature Pinschers breed, I have bred 1 American Champion, 2 Singapore Champions, 3 Indonesian Champions, 2 Malaysian Champions, 1 Thailand Champion, 1 Indian Champion and many pointed dogs in only 7 litters. In the Staffordshire Bull Terrier, I have finished 1 dog to Indonesian Champion title, BH (similar to a combination of the CD & CGC tests) and Anjing Jaga Madya (IPO1 protection phase) title, 1 dog to Companion Dog Excellent (CDX) and have bred 1 Indonesian Champion dog in only 2 litters. I strive for perfection in their temperament, soundness, breed type, and quality. My puppies are raised in the house and well socialized with other dogs and people. I also train my Staffordshire Bull Terrier for obedience competition and the dog sport of Schutzhund or IPO. I am an active member of Miniature Pinscher Club of America, Miniature Pinscher Club of Indonesia, Dobermann Club of Indonesia, The All Indonesian Kennel Club, Staffordshire Bull Terrier Club of Victoria and Victorian Canine Association. I hope you enjoy your visit. Please feel free to have a look around and contact me if you like to know more, I am more than happy to help.